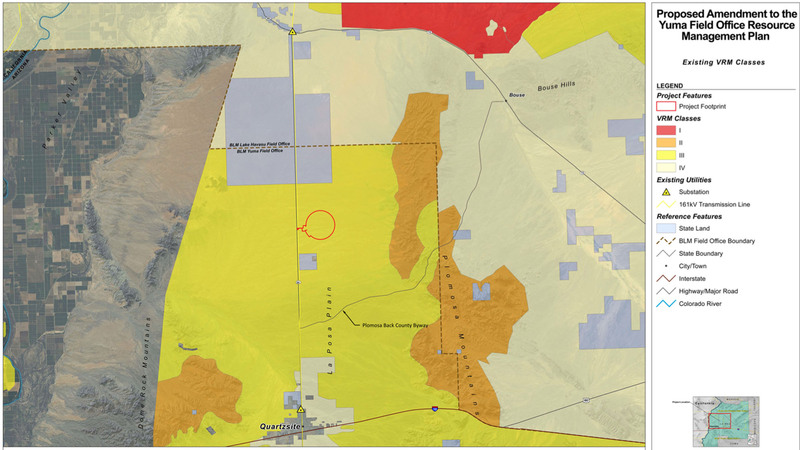 WASHINGTON – Federal officials gave a green light Monday to a proposed 100-megawatt solar-power plant near Quartzsite, a project that supporters say could create 438 short-term construction jobs and 50 full-time jobs. The project “will have a significant impact” across the La Paz County economy, said Mike Baker, the county’s development services director, driving up demand for housing and restaurants as it pumps new salaries into the area. Because of the project, “new tax bases will be created. There will be an economic benefit for sure,” Baker said. But the project’s developers noted that this approval is just one step in the process and that little can happen before they have power purchase agreements – promises from utilities that they will buy the power generated at Quartzsite. 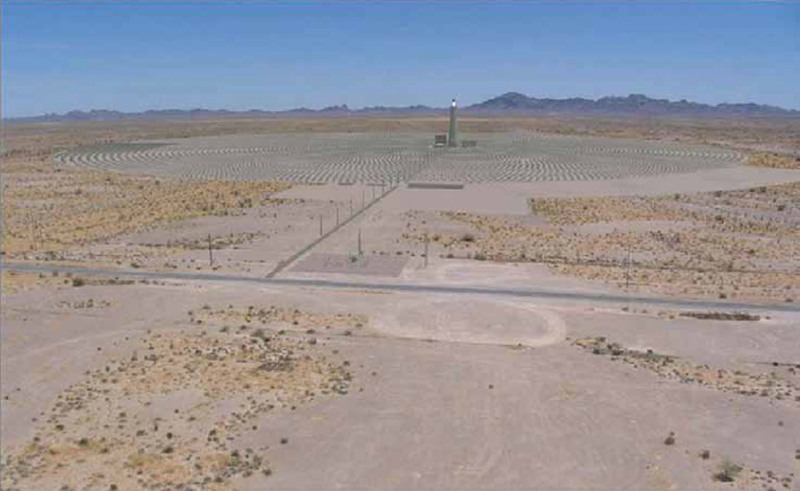 The Quartzsite Solar Energy Project is being developed by California-based SolarReserve. The project was one of three renewable energy projects approved Monday by the Interior Department, along with geothermal and solar facilities in Nevada. Government officials said construction on the Quartzsite project could begin sometime next year, and the plant could be operational by 2015, said Neil Kornze, the principal deputy director of the Bureau of Land Management. But Andrew Wang, SolarReserve’s director of development, said late 2015 would be the earliest the plant could come online, if purchase agreements were secured tomorrow. He said the Quartzsite site is ideal because it is flat and gets plenty of sunlight, and has access to power transmission lines. The 100-megawatt plant will use “power tower” technology, in which mirrors focus sunlight on a central tower. Liquid salt in the tower captures the solar heat and uses it to generate steam that, in turn, will generate electricity. The Bureau of Land Management estimates that electricity from the project could ultimately power more than 30,000 homes. The project is part of the bureau’s Restoration Design Energy Project, which set aside more than 192,000 acres of public land in Arizona for possible solar and wind-energy development. More than 45 renewable-energy projects have been approved since 2011, when the president announced an “all-of-the-above” energy plan that set a goal of authorizing 10,000 megawatts of such projects by the end of 2012. Interior Secretary Sally Jewell said Monday that the department has exceeded that goal by more than 2,500 megawatts. “There is demand out there for companies looking to reduce the carbon footprint,” Jewell said in a conference call announcing the projects’ approval. Environmental advocates in Arizona have some concerns about the Quartzsite plant but, “Overall, we’re glad to see more energy come from renewable energy resources,” said Sandy Bahr, a spokeswoman for the Grand Canyon chapter of the Sierra Club. She said the project will be put on land that is not disturbed, such as old agricultural or previously developed land. But the project will also use “dry cooling” that uses air to keep solar panels cool instead of “wet cooling,” which uses water – a scarce resource in Arizona. 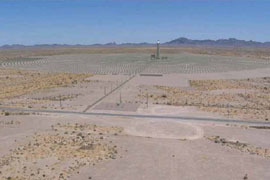 An artist's rendering of the concentrated solar power plant proposed for SolarReserve's plant near Quartzsite. The system uses a field of reflectors to focus sunlight on the top of a central tower, heating fluids inside to create steam and generate electricity. The Bureau of Land Management set aside about 2,000 acres near Quartzsite while it studied the feasibility of a solar-power plant there. 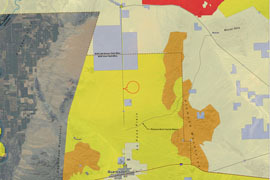 The area circled in red would be the site of the plant, which was given the green light Monday.